Heesen delivered Omaha to its owners in the Mediterranean, following sea trials in the North Sea. The 164-foot superyacht is the first of the Dutch shipyard’s 50-metre steel class. The exterior lines by Clifford Denn are long and lithe, inspired by classic car designs, with cutouts in the foredeck and long swaths of windows on both the main and upper decks. From the stern, the successively higher decks look like broad stair steps with large open spaces. The top deck features a rear hardtop that leaves the social area forward open. That not only provides a crow’s-nest view of the surrounding water from the forward Jacuzzi, but also allows the owners to hold large gatherings in the most select area of the yacht. The forward exterior has been tasked as the working end of the yacht, with space for tenders, personal watercraft, and an open foredeck area. Using the space this way frees up the stern, so the owners can enjoy the interior for social purposes, rather than as a tender garage, which is typical for this space. UK-based design studio Reymond Langton created the interior, which has accommodations for 10 guests in five staterooms. The owner’s suite is located on the main deck, just forward of the saloon, and the four other staterooms are located on the lower deck. 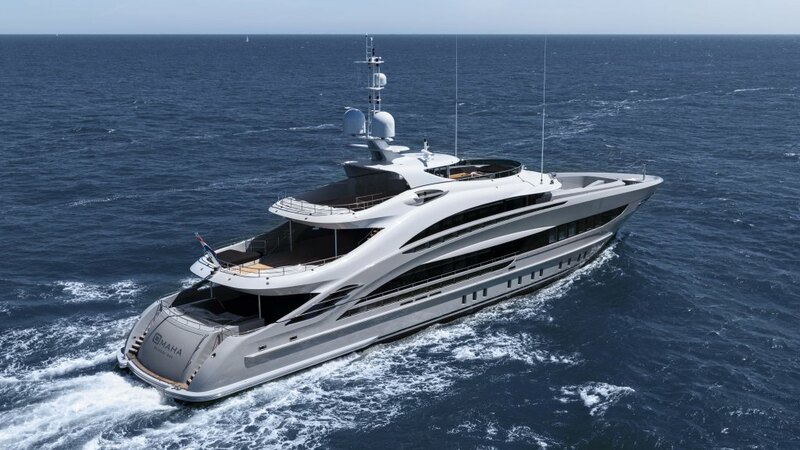 Heesen built this yacht to be a true ocean runner, with a steel hull that combines a bulbous bow and a running surface designed to run smoothly in most ocean conditions. 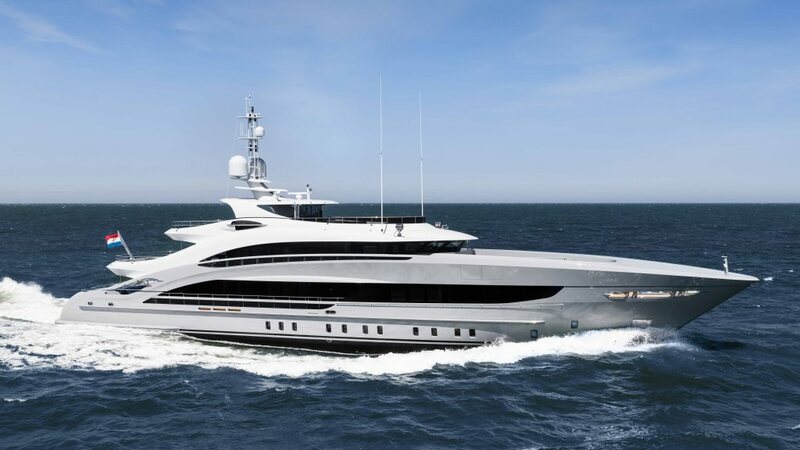 Omaha did not have to face severe conditions in its initial sea trials, but the relatively calm weather allowed Heesen to push the yacht to the max. Omaha’s twin MTU 8V4000 M63 engines gave the yacht a top speed of 16 knots, which is above the contractual top-end speed. The boat was designed with unusually large rudders and power steering, so it can maneuver easily in all conditions. At 12 knots, Omaha has a transatlantic range of 3800 nautical miles. The yacht’s sistership, Triton, is currently in build at the Heesen yard in Oss, and will be completed in early 2020.